This third offering from the Scottish prog rock outfit saw front man Cyrus return to bass guitar. Now also taking a more prominent position in the writing process he and keys player Stewart Bell delve into new areas of musical exploration. Reduced to a two-piece line-up they alone provide all the musicianship on the album and this new writing partnership saw the band move away from their musical roots on a voyage to discover their own sound and style. 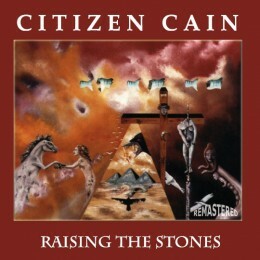 Recorded in 1996, released by Cyclops Records in 1997 and now remastered and reissued by F2Music in 2013 this album is a more complex and challenging listen than their previous works, yet it still retains the now established Citizen Cain sound. Although Cyrus’ input to the writing process introduced influences from more obscure prog greats like Gentle Giant, PFM, Brand X and Yes, critics once again pointed out the obvious likeness to early Genesis and Marillion. Desribed as a highly technical and musically relentless work Raising The Stones gained the band many new fans who had passed off their earlier work as just another Gensis clone.